Quotes from Chief Gillespie: "I got the motive which is money and the body which is dead." Quote from Detective Tibbs: "They call me MISTER Tibbs!" In a small southern town, redneck sheriff finds himself in an uneasy partnership with a black homicide detective from Philadelphia while investigating a murder. In The Heat Of The Night is "a superbly crafted murder mystery, set in the deep South at the height of the early 1960's racial tension." 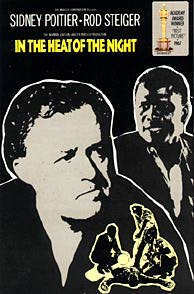 Rod Steiger gives an award winning performance as the provincial, prejudiced sheriff, and Sidney Poitier strikingly plays the northern black detective, with his own prejudices. Neither like each other much, as they started off on the wrong foot with each other, besides each having misconceptions about the other. Soon after the body is discovered in the street, a sweep of the train station by Officer Sam Wood (Warren Oates) finds a Virgil Tibbs waiting for the train, after visiting his mother. Tibbs is arrested and brought into the station as a suspect, until they find out he is a detective, much to everyone's surprise. After calling Tibbs' boss back in Philadelphia, Tibbs' boss offers the detective's services in helping in the investigation much to the annoyance of Virgil Tibbs and to the surprise of the now incredulous Chief of Police. But in the course of investigating the crime, "these two strong-willed men must reconcile their inherent prejudice toward each other," as both take their police investigation seriously, and want to find the killer. Thus, both are forced to see each other's talents and abilities, and find themselves relying on each other. The final result is justice - and an unlikely but touching mutual respect. 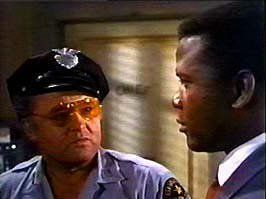 "With an Oscar-winning script by Stirling Silliphant and Norman Jewison's keen direction, "In The Heat of the Night" is riveting entertainment, as well as a biting social commentary, and one of Hollywood's most compelling achievements." Rod Steiger does an outstanding job portraying Chief of Police, Bill Gillespie a small town sheriff, who has had little experience with murders, and with black detectives, but knows he needs this officer's help in catching the guilty party. For the sake of law enforcement and justice he goes to a place he had never been before. He earned the Best Actor Oscar for his performance. Sidney Poitier also gives a marvelous performance as Virgil Tibbs, the black detective who is drafted into helping with the investigation against his will, but rises to the occasion to help find the killer out of duty to his profession. Supporting performances by Warren Oates (as Sam Wood) and Lee Grant (as Mrs. Philip Colbert) are both outstanding, and add a lot to the story. Scott Wilson (Harvey Oberst, Murder Suspect ), Beah Richards (Mama Caleba) , and Larry Gates, also offer bright character performances, which tell a viral part of the story. 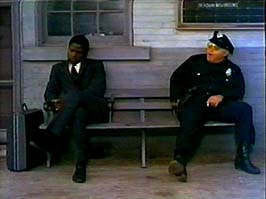 The Ray Charles song "In The Heat Of The Night" and the evocative score by Quincy Jones, and Haskell Wexler's vivid Cinematography all add to the film's "stifling aura of a hot summer evening in the South." If you enjoyed IN THE HEAT OF THE NIGHT you may like the "Maltese Falcon," "The Big Sleep," "48 Hours," "Rush Hour," "Beverly Hills Cop 1", "Gorky Park," "L.A. Confidential," and "They Call Me MISTER Tibbs!"